Apple has released iOS 11 beta 8 and macOS High Sierra beta 8 for developer beta testing. Additionally watchOS 4 beta 8 and tvOS 11 beta 8 are also available for developer preview. 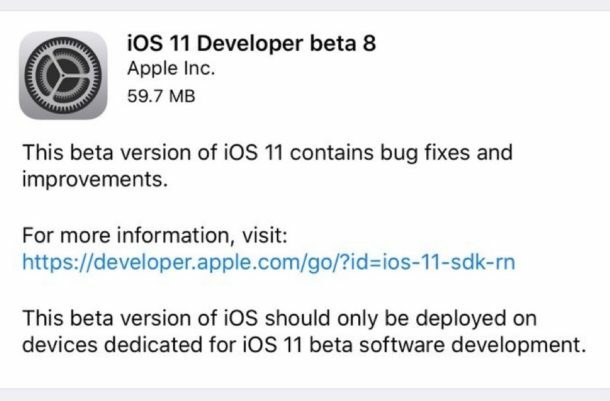 The iOS 11 and macOS 10.13 beta 8 builds are for developer preview versions only, but Apple has also released iOS 11 public beta 7 and macOS High Sierra public beta 7 for downloading as well. Eligible users can find macOS High Sierra 10.13 beta 8 via the Mac App Store Updates tab, and iOS 11 beta 8 can be found in the Settings app Software Update section of iOS. The latest beta updates are likely to focus on bug fixes and feature enhancements, rather than introducing new features or major changes to iOS 11 and macOS High Sierra as the fall public release date nears. While iOS 11 includes a variety of new features for both iPhone and iPad, the most noteworthy changes are found for iPad users with significant new multitasking capabilities and productivity features. Anyone can install and run iOS 11 beta on an iPad right now by going through the public beta testing program. Separately, Apple has apparently planned an event for September 12 where new iPhone models are expected to launch. Apple often releases final versions of new system software on or soon after the unveiling of new iPhone models, which would fit with their set timeline for iOS 11 and macOS High Sierra announced last June. What is the beta 8 “number”? Just downloaded install (17A352a). The “About this MAC” does not give the beta version. Public beta and from South Africa. The public beta is actually beta 7. When looking at about this Mac, I don’t think it ever shows the beta number, only the build number. You should see the beta number in the updates section of the App Store. Thanks in advance to anyone who is willing to take a minute to share their Beta ( for iOS ) experience(s) !! Much appreciated!